Wolf is a rich, pre-agricultural world with a moderate population over a hundred million, but not yet at a billion sophonts in size. 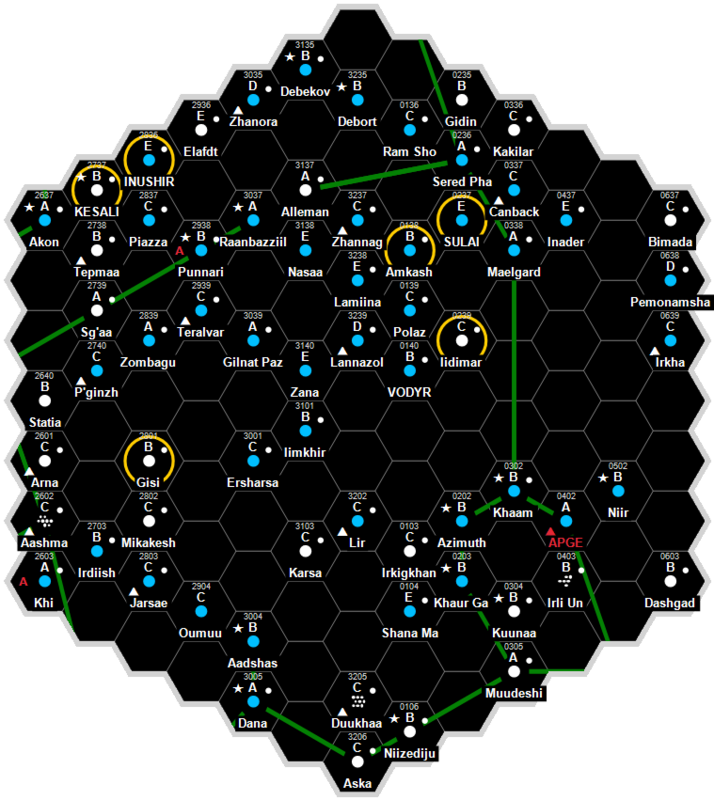 It is a Non-Aligned world dominated by human sophonts located in the Paradise Subsector of Halcyon Sector. This world lies on the Barabek Loop Star Lane. This world lies on the Wolfs Tail Star Lane. This world lies on the Athune Spur Star Lane. The primary is Kurghan, an ordinary orange main sequence star. It has a luminosity of 0.352 Sols, a mass of 0.774 Sols, and a diameter of 1.168 million km. The inner system consists of (I) a vacuum worldlet, and (II) a very thin atmosphere radworld. (III) Wolf orbits within the habitable zone and is designated the mainworld. (IV) a thin atmosphere hospitable world, (V) a dense rocky planetoid belt, (VI) a large gas giant, (VII) a small gas giant, (VIII) a small ice giant, (IX) a vacuum iceworld, and (X) an exotic atmosphere bigworld form the outer system. Many of the worlds retain satellites. (III) Wolf is designated the mainworld. It orbits Kurghan at a mean distance of 0.66 AU (98.7 million km), within the habitable zone. It has an orbital period of 222 days 15 hours and a rotation period of 17.5 hours. The axial tilt is 15 degrees. Wolf has a diameter of 8,655 km, a density of 5.72 g/cm³, and a surface gravity of 0.71 G. The world is geologically active. Its atmosphere is rated as Standard, with a mean surface pressure of 0.88 bar and a composition of 77% nitrogen, 22% oxygen, and 1% argon, water vapour, carbon dioxide, neon and other trace gases. Approximately 43% of the surface is covered in seas of liquid water: average tidal ranges exceed 0.4m. Mean surface temperature: 22°C. The atmosphere is active and strong weather systems driven by the star and the seas sweep across the globe. The climate is seasonal. Total surface area: 235 million km², Land surface area: 134 million km², Water surface area: 101 million km². Wolf has extensive native life. Their metabolic processes maintain a cycle of atmospheric renewal. Wolf has an excellent quality starport. Wolf possesses a Technology Level of TL–12 or TL-C in Hexadecimal Notation. FTL Notes: The limitations on DeVoss Drives – the so called Jump-2 Barrier – restricts jump drive performance to Jump-1 or jump-2 only. Wolf has a Feudal Technocracy government. Wolf Joint Military Command, is responsible for system defense operations. Fenris and Barnes Defense LLC. This page was last modified on 6 September 2018, at 08:49.